Balancing all of the tasks of parenthood in today’s busy world can feel overwhelming, especially if you’re trying to juggle a family and a busy career. What you may not realize, though, is just how much time you spend in waiting rooms and standing in lines, waiting for the next task to start. 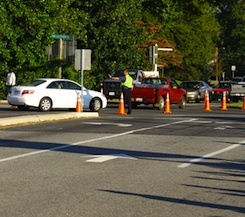 School pick-up zones are notoriously crowded, and can take forever to get through. You can end up spending a load of time in a state of suspended animation when you have to show up early to get in line and aren’t able to move until well after the last bell. Taking that time back and making it work in your favor by turning your daily pick-up chore into a time that’s packed with productivity can help you knock out a surprising number of items on your to-do list. Return Phone Calls and Text Messages – Talking on the phone or sending and receiving text messages while you’re driving is both dangerous and, in many areas of the country, illegal. Rather than risking an accident or a citation for allowing your phone to be a distraction while you drive, hold off on returning those calls or messages until you arrive at the school. Chances are that you’ll have plenty of time to attend to all of them while waiting for your little ones to be released. Check and Send Emails – Work emails don’t stop just because you’re off the clock for the day, but wrapping up any loose ends or responding to emails with your smartphone allows you to manage as much as possible before your children climb in the car with tales of their day and big accomplishments. Plan Meals for the Week – Cooking a healthy, balanced meal every night can seem like a task that’s simply too large to manage for busy, working moms. What you may not realize is that planning the meals for every night of the week in advance and selecting quick, easy recipes can make preparing dinner each night a snap. Make Your Grocery List – Grocery shopping without a list increases your chances of forgetting vital items, and can even cause you to spend more than you intended as you fill the cart with impulse items. While you’re waiting for that last bell to ring and the kids to come flooding out of the doors, why not put the finishing touches on your grocery list? Do Some Online Shopping – Picking up that last minute gift for a friend or relative, saving money on household items from online retailers and even finding the perfect outfit can all be done quickly and easily while you’re waiting in line to pick up your children from school. Catch Up on the News – It’s not easy to find time each day to dedicate to reading the news, but staying informed of current events is necessary during such turbulent times. Grab the newspaper on your way out of the door or pull up headlines on a smartphone while you’re in the pick-up line. Foster a Hobby – Something as relaxing and rewarding as knitting or crocheting is definitely productive, especially if you turn out a scarf or a darling pair of mittens along the way. Knitting and crochet projects can be easily transported in a small, dedicated bag and whipped out at a moment’s notice. Remember that it’s never too late to learn a new skill, and that any time spent improving yourself by increasing your knowledge is certainly time spent well. Organize Your Calendar – Keeping up with everything you have to do, all of the upcoming events in your family and the schedules of your children can feel like a full-time job all by itself. Getting a calendar organized and ready to go for the days and weeks ahead can be done while you’re waiting in the pick-up line, and can minimize the likelihood of important appointments falling through the cracks. Read – Whether you’re reading a hefty instructional tome or mystery fiction, it’s difficult to argue with reading as a productive activity. Because books and eReaders are also quite portable, you can easily take them with you while you wait in school pick-up traffic. Map Out an Exercise Plan – Getting in shape requires dedication and determination, along with a solid plan of attack. Spending the sedentary moments of your pick-up wait time to organize your exercise routine and plan a new diet is a great way to pass the time in a healthy, worthwhile fashion. Remember that productivity doesn’t just consist of cranking out projects and crossing items off of lists. Sometimes the most productive thing you can do is simply relax, so don’t be afraid to spend part of your time in line meditating, praying or breathing deeply in a bid to collect your thoughts and get motivated for the rest of the evening.